The latest USDA Cattle on Feed Report was released on Friday and showed some positive news for prices for the rest of Fall and into early 2019. The inventory is still large. 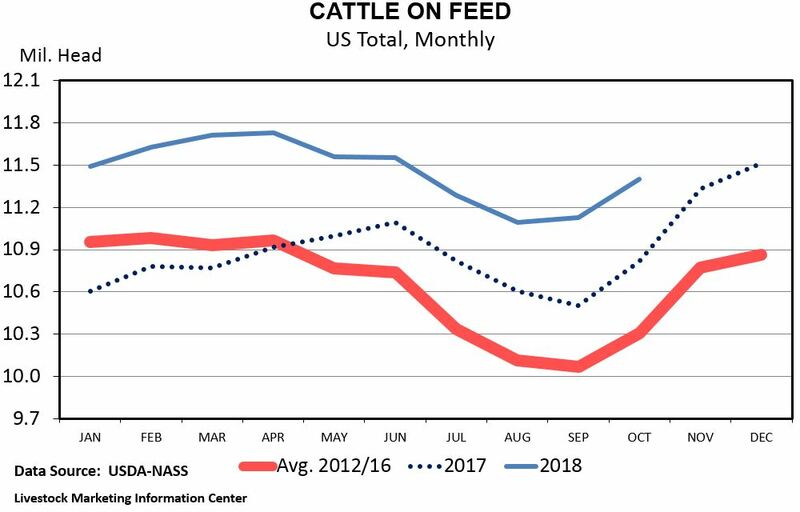 Indeed it is another “record-large” total as 11.4 million head in feedlots is the largest October 1st total since the COF series began in 1996. However, it is what was contained in this report relative to pre-report expectations that provided some price support as futures prices showed strength in Monday trading. Placements of cattle into feedlots were 2.05 million head during September. Importantly, this is 4.6% lower than September 2017. Perhaps even more importantly, this is about 5% lower than was expected pre-report. A lower placement and supply number than expected is what led to some market strength on Monday. Relative to 2017, the number of heifers in the mix is 11% larger at 4.3 million head. The number of steers is up a more modest 2.3% at 7.1 million head. The story over the past few months has been of lower placement weights and that was again the case in September. This is an interesting dynamic that ultimately has an impact on lower average slaughter weights. Fed Cattle Marketings were 3.6% lower than September of 2017. While this number is lower, it was well anticipated going into the report. The combination of the anticipated marketing rate and the lower than expected placement rate led the inventory in feedlots number to be lower than expected. However, it is still a big number which is likely to keep a cap on market price potential in the near-term. It is encouraging to prices that it seems like there may be fewer supplies than expected, but the calf crop is still larger than a year ago and we still have to work through these large supplies. The combination of a large number of heifers in the mix and continued high cow-slaughter numbers do provide credence to the projection of a flattening total herd number over the next year or two.